Joe Rogan admits to being “a dork”. He said he has always had questions on the strange, “silly things for an adult to concentrate on.” Rogan said that all the shows that he has ever seen on such topics have been either debunking shows or shows that embraced every ridiculous possibilities. His goal for “Joe Questions Everything” was to create a camp to bring everything together and do it with comedians and make it entertaining. He said that they’re “dumb” subjects that he wanted to “treat with a sense of human and with an open mind.” He and his production team talked to scientists to come-up with some answers and make an entertaining show. A fan of such classic forums as television show “In Search of” and radio show “Coast to Coast”, Rogan said he approached every subject with an open mind as much as possible. One of the topic explored is HARP – ray of antennas that they have in Alaska that shoots rays to heat up the atmosphere. The shifting of the ionosphere. The explanation is that it was designed to bring people reception. However, scientists whom they talked to said it was made to manipulate the weather and cause storms. In Rogan’s comedy and research troupe are comedians Duncan Trussell, and Ari Shaffir. Rogan said they are also two of his closest friends. Rogan said it’s important that the stand-up comedians are not just funny but also articulate. Duncan and him went to Bigelow Ranch, a famous UFO hotspot. But, the most ridiculous he said is when people are willing to believe bullet proof wolves and beings called “shape shifters”. Another problem, Rogan said, is “confirmation bias”. This is when people find something that they believe in and find as much evidence as possible to support it but nothing that debunks it. Rogan stated, “That’s an issue we delve into.” Some terrifying moments was on the man-made viruses from scientists explaining the process of it and what is possible. Vaccines, mutations, he said it scared the crap of him. In the premiere episode, “Joe Rogan Questions Everything” uncovered some “evidence” from a geneticist (a science teacher to a geneticist at NYU), Todd Disotell, who’s a primatologist and an expert in genetics. He also brought them to David Swenson, who has thirty published papers. Rogan said this “evidence” was in the form of published work and hair and stool samples. Conspiracy theories was something that was not on the show’s radar. Rogan said he wants the show to be “a fun show” along the lines of Art Bell, but with comedians. “It wasn’t our intent going in. Along the way, we did uncover some things that do fall in the line with those types of subjects, But it was really unintentional. It wasn’t something that we set out to do. We set out to just have fun with it,” Rogan explained. 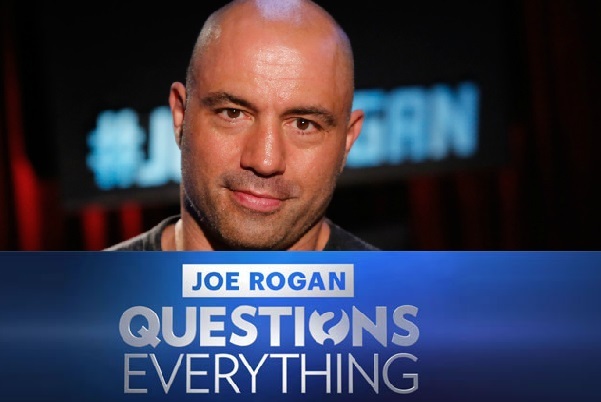 “Joe Rogan Questions Everything” airs Wednesdays at 10/9 c on Syfy.